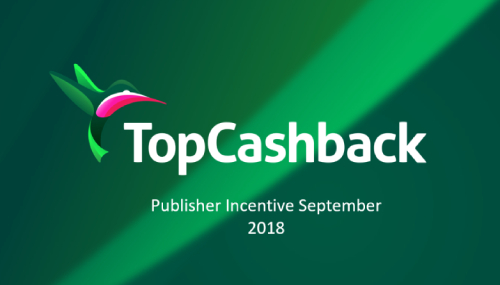 In the month of September TopCashback are offering a special incentive for BOTH new and existing publishers on our affiliate program! New publishers joining within the promotional period (1st September- 30th September) will be eligible for the bonus below in addition to their agreed CPL rate. You can join the TopCashback advertiser programme here. For our existing publishers, we’re offering a £150 prize for the publisher who has the biggest % growth month on month for valid leads generated (compared to August 2018). and displayed on our profile until 01/11/2018. To be eligible for the new publisher incentive payment, new publishers must be accepted on the programme and generate the new members (Merchant ID 2459) between 01/09/2018 and 30/09/2018. Sign-ups must be generated in line with the TopCashback Affiliate Programme terms and conditions. For the avoidance of doubt, this means that sign-ups may not be generated using incentivised traffic and the campaign must not be brokered/ sub-brokered out. Full terms can be found on our profile. TopCashback reserves the right to decline any sign-ups that have come from sources which breach the terms and conditions. New publishers are only eligible for the new publisher promotion, and existing publishers are only eligible for the existing member promotions. TopCashback reserves the right to end this promotion at any time. The promotional one-off bonus will be paid in the first 14 days of the promotion end date. The existing publisher prize draw to win £150 will be drawn at random using random.org. We look forward to working with you and welcome any questions you may have. To contact us, please contact Jack or Rachel on the details below.